So, I have one week of down time, before everything picks up again so I thought I would try and catch up on some blog entries that I started and never finished because of deadlines. Well, Meghan found me awhile ago and now its time to create her wedding invitations. 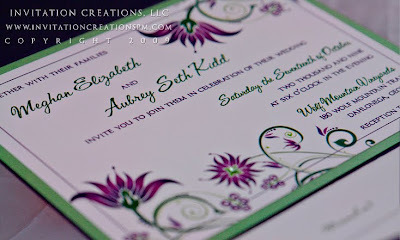 She decided to continue with the same graphic from her save-the-dates to create that branding effect. I love, love, love this color combination. 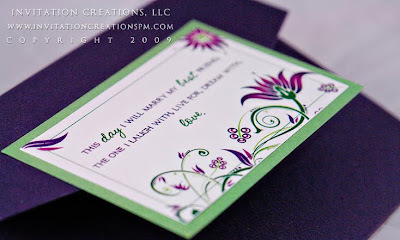 I've heard from a lot of my clients that I work well with colors. Well, its clients like these that give me this opportunity to do so, that it can really shine! This pocketfold is a 4x5 pocketfold. Really cute!! Smaller and more economical than its sibling, the 5"x7". 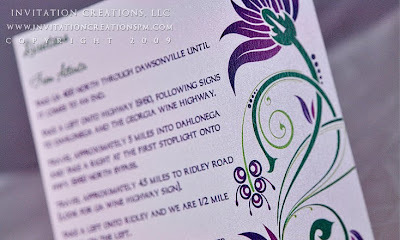 We did a a directions card and postcard rsvp in the smallest size possible, 3.5"x5. 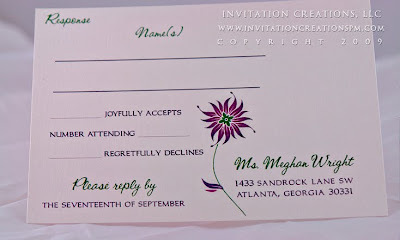 Added a little bit of color on the return address and voila! !